There is nothing in Space Cowboys we haven't seen before: an unlikely group of neophytes (Armageddon) undergoes astronaut training (The Right Stuff) to go on a mission in space that goes wrong (Apollo 13) and ends up saving the world (Deep Impact). Nope, nothing new here. Yet, Space Cowboys is mostly an enjoyable romp because of the main cast's sheer charisma and star presence. Sure, Clint Eastwood, Donald Sutherland, James Garner and Tommy Lee Jones may all be ready for the retirement home, but this movie shows what is wrong with most of today's young Hollywood actors: they simply have no screen presence, and are merely generic pretty pin-up posters for today's 13-year-olds. Yep, they sure don't make them like they used to. While the group played by said set of actors would probably be obnoxious and annoying in real life, on screen they are imminently likeable. Despite some old age home gags running throughout the movie, Clint and company are still the heroes at the end of the movie; so don't go expecting any heavy Unforgiven-style deconstruction of Clint's screen persona. Finally the cast pulls Space Cowboys through. There are some realistic special effects, which are much better than we have any right to expect (compare them to Clint's last effects movie, Firefox, and you'll realize how much the definition of 'state-of-art' has changed) towards the end, but little else. The cast shines in the first half of the movie, while in the second half they are simply required to go through the predictable motions. 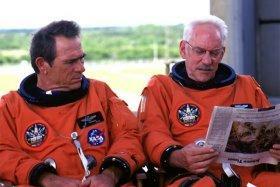 Still, Space Cowboys is an entertaining two hours spent at the cinema.